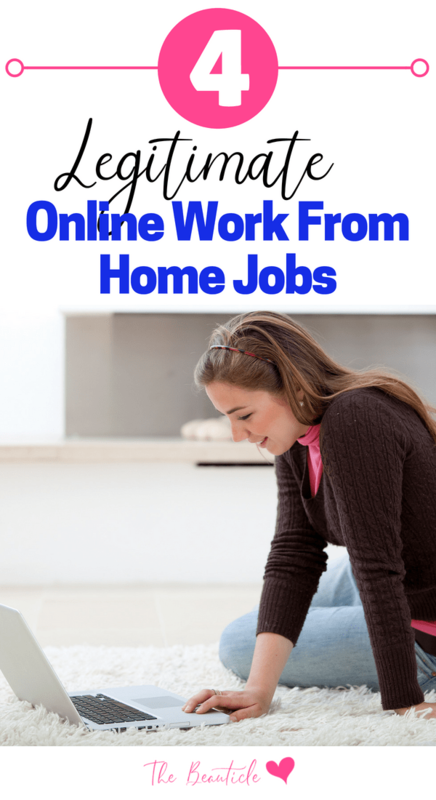 This guest post from The Daily Change Jar highlights legitimate work from home business ideas like online typing jobs, clerical work from home, work from home data entry jobs, computing homework and other types of work for stay at home moms. If you’ve been wanting to start a home-based side hustle online then try some of these options. Working from home is a great way to add income to your home purse while still being with your little ones full-time! If you’re looking for such an opportunity, there are tons of actually legit work at home jobs out there. However, a simple search in any job directory will lead you to many phone-based jobs. And even if you don’t mind being on the phone, it can be rather difficult with little runs running around all day. I swear, my kids are perfectly content, until I need to make a phone call. It’s like they have a sixth sense that I am trying to do something important and feel the immediate need to interrupt my phone conversation. Or maybe you just straight up hate talking to people on the phone. I totally get it! Most days I don’t want to talk to anyone either! Being on the phone all day can be exhausting too. If you have ever worked in a call center (been there, done that) I feel your pain! I would come home after working at a call center all day and cry to my husband. Here are 4 types of legit online jobs that hire remote works-no phone calls required! Ok, so these jobs don’t pay a lot, but they are worth including if you are looking for something to get started with. You should at least not hate data entry and looking at numbers all day. ClickWorker – Use your own computer and create your own schedule as an independent contractor. Are you one of those kinds of people that can notice a typo in just about any document? Then proofreading might be the perfect work at home job for you! Proofreading provides a flexible schedule and all the work you can handle. Gramlee – Perfect for the grammar fanatic and always accepting applications. ProofreadingPal – Must have a graduate degree and experience, but can make between $500-$3,000 per month. If you love talking with people in Facebook groups or other online communities, this might be the perfect online gig for you! Community moderators oversee content in Facebook groups, forums, social media accounts, and other online communities. They help to answer questions, remove spam or junk content and make sure the community is running as advertised. The best place to start: groups you are already a part of. If you are part of any online community that uses moderators, there is a good chance they are paid. Reach out to the admins of the page and politely share your interest in becoming a moderator. The Social Element – A diverse online team that provides flexibility and prides themselves on work-life balance. ICUC – A great opportunity for anyone that speaks more than one language. The ModSquad – A great team of people working in industries such as gaming and ecommerce. Do you love to write but don’t want the responsibility of managing a blog? Then freelance writing and other online writing jobs for beginners might be a better option for you. There are limitless opportunities online to get your writing out there. Although you might not make a lot starting out, you can work on building a portfolio and client base. I have found a wonderful hidden gem I would like to share with you guys when it comes to writing. Check out Facebook groups. There are a ton of VA groups and “content for sale” groups where you can write 500+ word articles and sell them for $20-$30 a piece. Upwork – A freelance network for not only writers but also for graphic design, mobile development, and customer service just to name a few. ProBlogger – Originally a blog dedicated to blogging and online marketing has now also become a great resource for freelance writing positions. TextBroker – Access to thousands of writing opportunities in just about any topic you can think of! Whether you’re choosing online writing jobs for beginners, proofreading, social media content moderating, data entry or other opportunities online for work from home mums, you’ll agree that the ideas are vast and limitless. Start with these and build your online income and portfolio to whatever your goals are. Keegan Kraemer blogs at TheDailyChangeJar.com, a site dedicated to empowering women to take control of their finances through frugal living and savvy side hustles. As a mother of 6, she knows a thing or two about living frugally and making a side income through random hustles. Be sure to get your free copy of Keegan’s Savvy Girl’s Guide to Financial Freedom.